Field Visibility Add-on gives you the possibility create User Locked fields or fields which are only visible to the Administrator, it also allows you to show/hide fields on certain forms and you can show/hide fields only for specific User Roles. 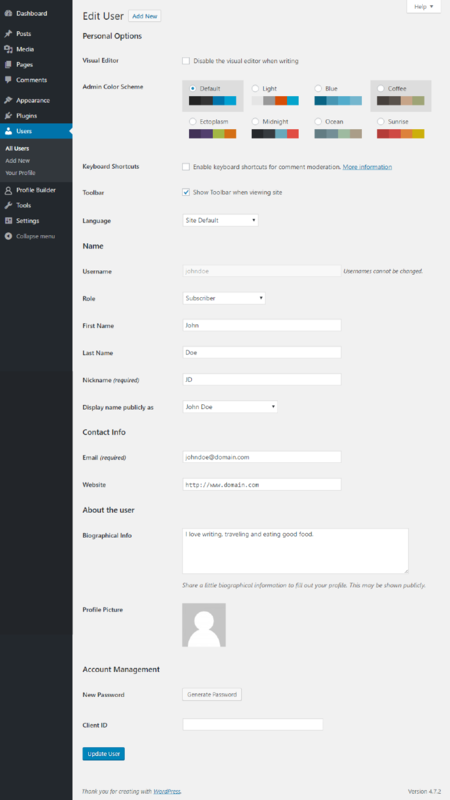 This allows you to have a single Edit Profile Form for multiple user roles, for example. 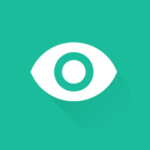 Field Visibility is an Advanced add-on, available with a Profile Builder Hobbyist or Pro license only. Alternatively, you can install the Field Visibility add-on by extracting the folder found inside the archive and uploading the entire folder via FTP to your /wp-content/plugins folder found inside your WordPress install. Please keep in mind that the Field Visibility add-on is not compatible with the fields in the “Other” section, so these options will not be displayed for them. This the default option and it means that the User and the Admin can both see and edit the field. Inside the User Role Visibility option check “All” to display the field to logged out users. This options means that the field is visible and editable only by Administrators. The values selected inside the User Role Visibility option will not overwrite the “Admin Only” option. This is how the Admin sees the Registration form. 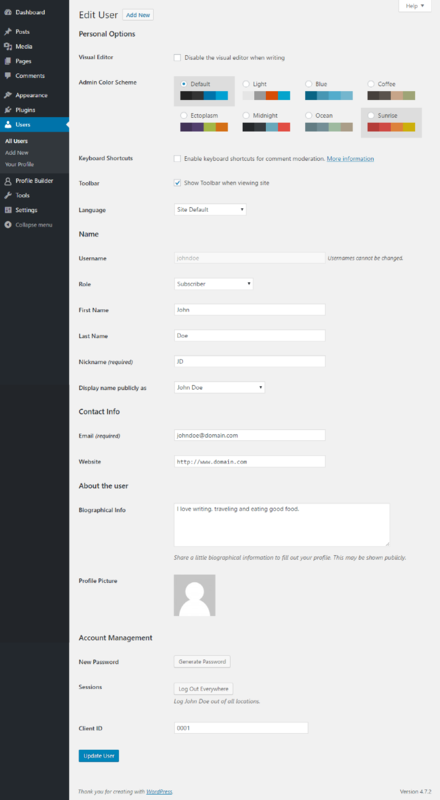 This is how the Admin sees the Edit Profile form. 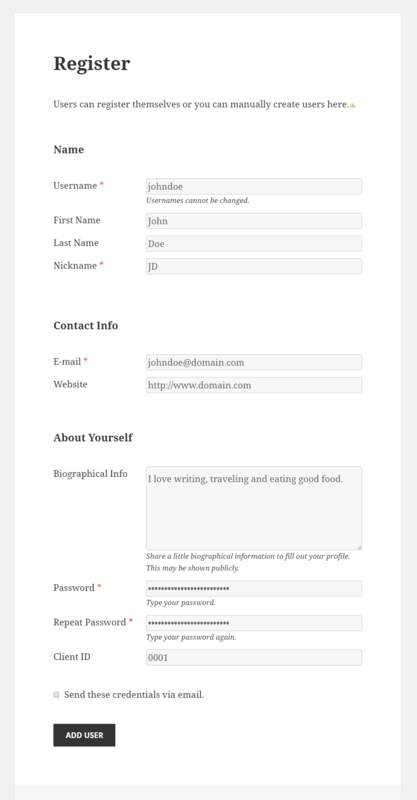 This is how the Admin sees the WordPress Edit Profile form. 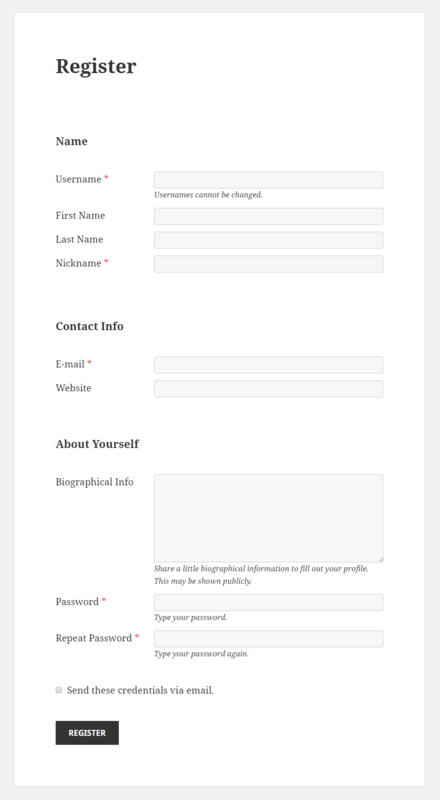 This is how the user sees the Registration form. 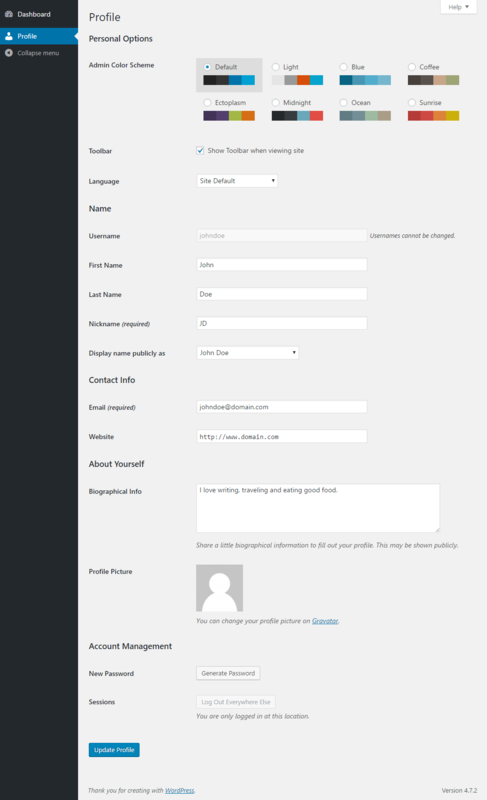 This is how the user sees the Edit Profile form. 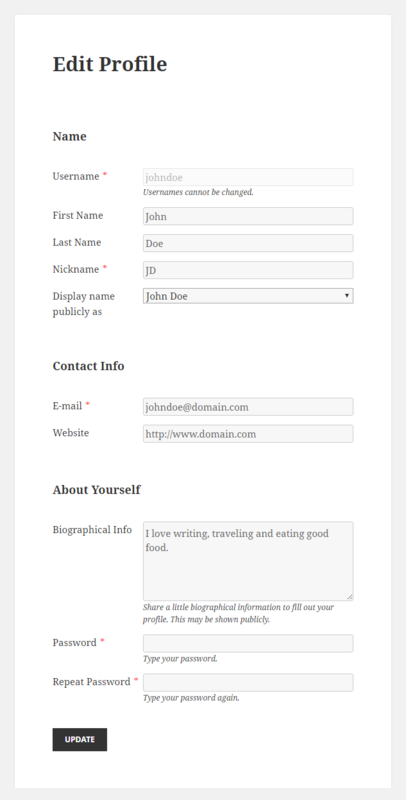 This is how the user sees the WordPress Edit Profile form. It means that the field is visible for both the Administrator and the User, but only the Administrator will be able to edit it. Check the “All” value inside the User Role Visibility option to display the user locked field to all the user roles. This option gives you the ability to show/hide a field only for certain User Roles. 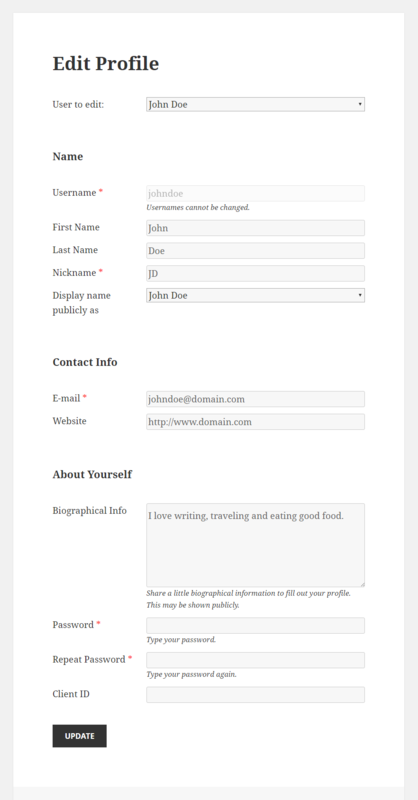 For example, you might have an Editor and a Subscriber user role, and you want them to be able to update their profile using the same Edit Profile page, but you are requesting different details about them upon registration. 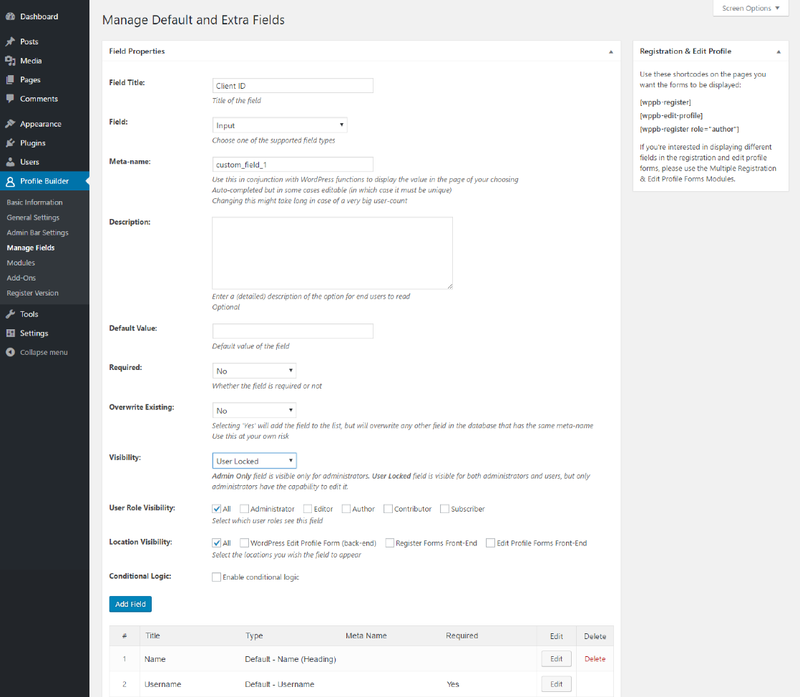 This options allows you to show only the relevant fields to the Editor or Subscriber user roles, even thought your form contains all the fields. Inside the User Role Visibility option check “All” to display the field to logged out users. The values selected inside the User Role Visibility option will not overwrite the “Admin Only” option. This option gives you the ability to show the field only in certain forms. 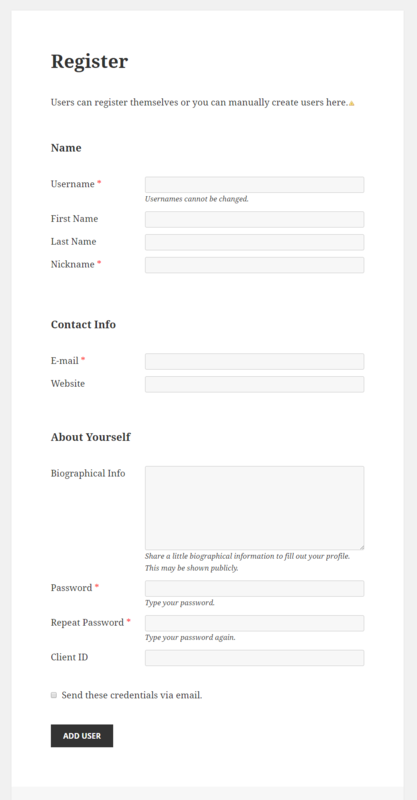 Lets say that we have a User Locked Select Field but we want to display this field in the Registration Form. We want to let our users select a value inside the Select field but after the Registration we want this Select field to become a read only field inside the Edit Profile page. Also we want only the Admin to be able to modify the value displayed inside the Select Field. Go to Profile Builder -> Manage Fields -> Add a Select Field and in the Visibility option choose User Locked and for the the User Role Visibility and Location Visibility check the “All” value. 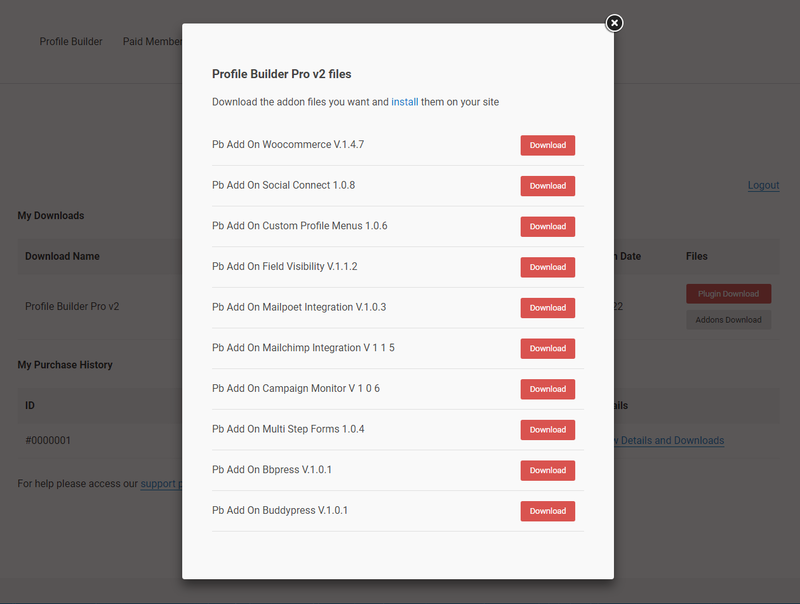 This will work only in Front End and if users have access to the Back End they will be able to modify it. 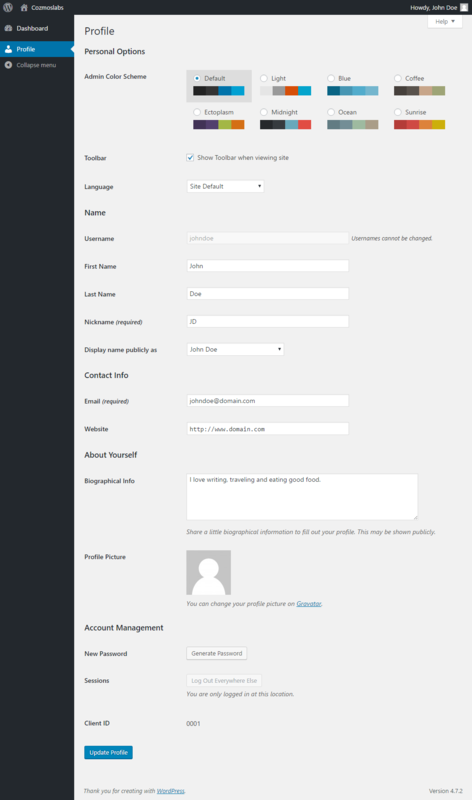 The Admin will be able to modify it in Front End.